Sometimes you just have to go for broke and hope for the best. 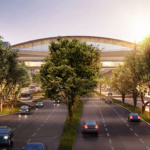 At least, that seems to be the route the developers behind a massive Rafael Viñoly Architects-designed project slated for the dying Vallco mall in Cupertino, California have in mind, as they push forward with a new, denser version of their long-stalled Vallco Town Center project. Developer Sand Hill Property Company unveiled a new vision for the 55-acre site yesterday that invokes the recently-passed SB-35 state law, a measure that allows developers to override local opposition and certain environmental controls for projects that meet local zoning code and set aside a specified percentage of their proposed housing units as affordable homes. view of pedestrian shopping areas. In the case of Vallco Town Center, Sand Hill Property Company is proposing a total of 2,402 units, with 1,201 of those set aside for extremely low- and low-income residents. 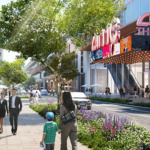 The eye-catching project proposes replacing the city’s cratered mall with a sprawling mixed-use town square-style district containing 400,000 square feet of retail and entertainment functions, 1.81 million square feet of offices, as well as the aforementioned housing element. 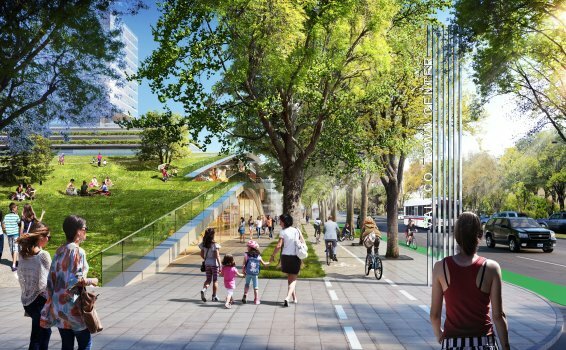 The entire thing, according to new renderings unveiled in tandem with the SB-35 plan, will be capped by a parabolic, publicly-accessible rooftop garden. 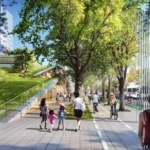 According to a project website, the community park will feature walking and jogging trails, playing fields, picnic areas, orchards and organic gardens, children’s play zones as well as a “refuge for native species of plants and birds.” A series of public squares will also populate the retail areas, while super-sized entry portals will demarcate the development from adjacent, single-family home areas. 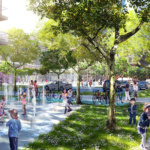 Under the latest plan, the Vallco development would help Cupertino surpass a state-mandated affordable housing production goal set of building 1,064 affordable units by 2022, The San Francisco Chronicle reports. The city has so far approved just over 800 affordable units via other projects. 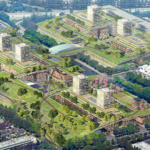 The developers have been working with community stakeholders and municipal authorities since 2015 on various versions of a proposed redevelopment plan, with the most recent reboot prior to the latest effort occurring in late-2016. Although the developers are pushing for aggressive expansion and a faster timeline with their latest version of the project, Sand Hill “does not intend for its SB-35 application to upset the ongoing planning process,” according to the project website. Under the new SB-35 regulations, local authorities have between 90 and 180 days to approve compliant projects. That gives the municipality three to six months to hammer out a compromise with Sand Hill, a prospect that is unlikely given the strong anti-housing bias city residents and officials have taken to this and similar projects. An updated construction timeline has not been provided.